Pink Floyd today unveiled the artwork for upcoming album The Endless River by displaying in 10 cities around the world, including an eight-metre installation on London’s South Bank. David Gilmour and Nick mason have also revealed that the title – a tribute to late keyboardist Rick Wright – will be released on November 10 as an 18-track, four-sided double-album, with the intent of promoting the classic format. Gilmour has confirmed Floyd’s first record in 21 years has its roots in sessions for 1993 release The Division Bell. He says: “We listened to over 20 hours of the three of us playing together. Over the last year we’ve added new parts, re-recorded others and generally harnessed studio technology to make a 21st century Pink Floyd album. 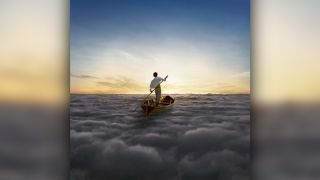 _The Endless River _is mainly instrumental, with one song, Louder Than Words, featuring lyrics by Gilmour’s wife Polly Samson. The cover concept was created by 18-year-old Egyptian digital artist Ahmed Emad Eldin, discovered by Hipgnosis partner Po Powell following the death of Storm Thorgerson last year. Powell says: “When we saw Ahmed’s image it had an instant Floydian resonance. It’s enigmatic and open to interpretation.” It’s on display in an eight-metre installation on London’s South Bank. It will be available in a number of formats: double vinyl in gatefold sleeve with 16-page booklet; deluxe CD/DVD with hardcover booklet, collector’s cards and 39 minutes of additional material; CD/Blu-ray with additional digital mixes; standard CD and download. It’s available for pre-order in physical and digital versions now.